Listrak believes in keeping lists clean, and that the quality of contacts is more important than quantity. Any contact who has asked to be removed from the list should be unsubscribed, but it is also important to keep an eye on bounces. 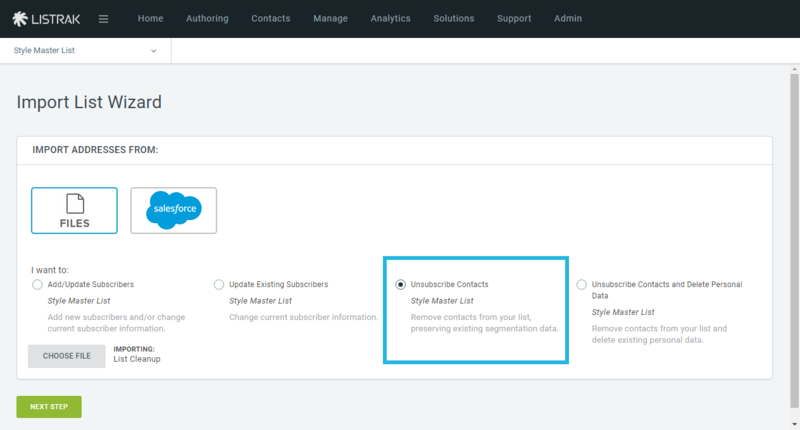 This guide provides an overview of how and when to unsubscribe contacts based on bounce status. Click the export icon on the top right-hand corner of the page. Select an export type (.csv or .xls). Do not include segment data. Select to have the report emailed to you or download it immediately. Only remove Soft Bounces and Mailbox Full reasons with counts under 8. These contacts have now been unsubscribed from the list. You will not be able to re-import them to this list but they can be added back manually if needed. Repeat this process every few months to keep the list clean. This process is unique to each list so be sure that the list on which you want to work is the current list. If someone is unsubscribed from your Marketing List, the Shopping Cart Abandonment and/or Post Purchase lists will not be affected. Use the trash can icon to remove individual contacts.